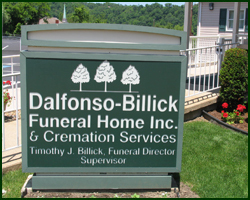 Dalfonso-Billick Funeral Home and Cremation Services was established in 1995, after Timothy J. Billick purchased the business from the previous owner, Raymond D. Dalfonso. The name of the funeral home was taken from the last names of the previous owner and the new owner, thus giving the funeral home its own identity. The funeral home has a history dating back to the late 1940’s when Perry Cozza purchased a home on Reed Avenue, and transformed it into a funeral home. Mr. Cozza operated the funeral home until his untimely death in 1958, at which time Raymond D. Dalfonso purchased the business. Mr. Dalfonso expanded the facility in 1960 by adding a new larger viewing room, and continued to operate the business until 1995. Mr. Dalfonso retired shortly after selling the funeral home. After purchasing the business, Timothy J. Billick, who has been a licensed Pennsylvania Funeral Director since 1979, knew remodeling and expanding the facility was necessary in order to better serve the public. Many changes have been made since 1995, including the building being completely remodeled, made handicapped accessible, the addition of a lounge, and expansion almost doubling the size of the structure. Another improvement is the 80 space level parking lot, which allows for off street parking, all on the same side of the street. 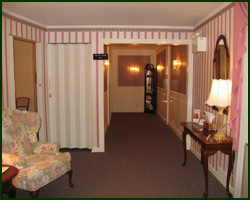 The funeral home has been tastefully decorated with a home like atmosphere, and is able to meet the needs of all families. Remember when you did business with someone, someone like your neighbor who owned the corner meat market, or maybe the milkman who delivered milk and eggs right to your door everyday? Remember how it was more like friends talking to friends than business deal. You trusted that person, and that person treated you like a member of his own family. Today, we don’t see to many businesses going that extra mile, and giving that kind of customer service, and sadly, we really don’t expect to be treated like “family” anymore. At the Dalfonso-Billick Funeral Home and Cremation Services, we treat the families we serve like they are part of our own family. My name is Timothy J. Billick and I am the President and Supervisor of our funeral home. I remember as I was growing up, I was always taught to treat people the way you would want them to treat you, treat them like they were part of your own family. I was told that if you treat the person you are dealing with like he or she is a member of your own family, then you would be treating them with respect and kindness. I think every person who operates a business has their own way of measuring whether they’re successful or not, and we measure our success by the kind comments people make about the service we provide, and how comfortable we made them feel during one of the most difficult times in their life. We have built a reputation for treating people like family, being attentive to detail, and helping walk families through the funeral process. I’ve always said, “We provide friends and neighbors with a professional, compassionate, and dignified service”. All you have to do is ask one of the families we have served and they will tell you, that what we say is true. Our funeral home is a full service funeral home, serving all faiths and nationalities, and provides a full range of funeral options, including cremation and traditional services. 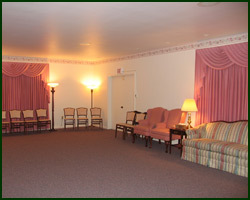 The funeral home also provides families the opportunity to preplan the funeral, and if they choose, prepay the funeral.